BPJ series centerless round bar grinding machine specially grinds the oxide skin and small flaw on the round bar steel and pipe billet surface to improve the surface quality of the steel. This machine is controlled by PLC and the operation only needs 2 people. We can make it into various types like the 6-grinding head~15-grinding head type, etc. according to the flaw depth of steel bar surface. This machine was originally created by our company in 1998 and got the national patent in 2000. And it was identified as the “Jiangsu Province High and New Technology Product” in 2002 and also honored as the “Wuxi Famous-brand Product”. 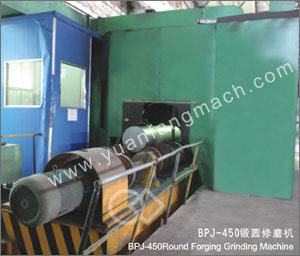 This machine is used for grinding the excircle of round bar steel and wiping off the oxide skin and microcracks, etc. to improve the surface quality and save the secondary waste generated by the surface defect and eliminate the environment pollution caused by the pickling process, then the economic benefit of the enterprise can be improved. This machine is used for the excircle grinding of large-scale bar and has the function of whole skin peeling off and point grinding.